The arrival of the Maori people to New Zealand is deemed as somewhat of a mystery. It is estimated that the first Polynesians arrived over 1000 years ago, possibly around 800AD or even earlier. Linguistic and cultural evidence suggests that the Maori travelled originally from the Cook Islands - an enormous feat at that time considering the prevailing winds make sailing in a southeast direction extremely difficult. It is because of this that the first navigators probably came here by design, looking for land whose presence may have been indicated by migratory birds, still flying these paths today. It is unknown if these first explorers actually settled here, or if in fact they returned to the Rarotongan Islands to herald the migration. By the end of the fourteenth century settlement was established throughout the country, most being in the warmer climes of the north, being closer to that of their origins. Being Neolithic, devoid of hides and textiles, they clothed themselves in cloaks constructed with woven flax and adorned with dog fur or feathers provided by many native birds including kiwi and moa. The northern conditions were favourable for many of the subtropical food plants they brought with them, in particular the sweet potato, or Kumara. The Maori people also lived off the abundant produce provided by native birds and the sea. In the south the bird life was hunted to extinction, the most famous of which being the Moa, the spectacular flightless bird that could reach up to 3.7m in height. As the Polynesian population increased, the lifestyle of opportunism gradually adjusted to a more conservative existence involving garden agriculture, storing of food and distinctive settlements emerged. Communities grew up around fertile land that was close to birding and fishing locations, resulting in a home focus for the whanau (family) and connecting families in the hapu (clan). Geographical features established natural territorial boundaries and as marriage loyalties were encouraged within the whanau and hapu, the iwi (tribe) culture evolved. Wood, bone and greenstone (jade) carving was both an art and a necessity, providing the tools in which to catch, propagate and prepare food. With the growing need to protect property and possessions, these skills lead to the design and implementation of weaponry for close quarter fighting. The pa (fortified village) was developed on terraced hilltops with concentric walls. If the outer wall was successfully invaded, the defenders could continue retreating to the next fortified inner terrace. Evidence of these fortifications still exist and can be seen on many raised hills and knolls throughout the country. War was accompanied with its own worship, sacrifices, rituals, dances and art forms - exhibitions of these can be observed today at various formal occasions and at many tourist attractions. Tribes engaged eagerly into numerous battles over territory, utu (revenge) and for other reasons - the losers often becoming slaves or food. The Maori developed elaborate artistic traditions, evident in the marae, especially on the ornate meetinghouses built featuring powerful wooden carvings depicting ancestors and their history. Woven flax panels called tuku tuku and symbolic paintings were also widespread throughout the communities. The high-ranking men were decorated with intricate tattoos on their faces and buttocks, while women of similar prestige wore moko’s, a facial tattoo on the chin. By the mid-eighteenth century, a rich, complex society had grown throughout the country, linked as one people with myths and legends telling tales of the arrival of their ancestors and of the formation of Aotearoa - The Land of the Long White Cloud. The first of the European voyagers arrived in 1642, a Dutch explorer, Abel Tasman quickly left after four crewmembers were killed and eaten by the Maori in Golden Bay. Over 100 years later, Captain James Cook sailed south from Tahiti in the Endeavour, successfully charting the coastline and establishing workable relations with many of the Maori people he encountered during his six-month stay. Although few Europeans arrived in New Zealand over the 70 years that followed Cooks rediscovery, the exploitation of the country’s natural resources began almost immediately, as did the introduction of animals and manmade items that saw Maori shift overnight from the stone to the iron age. The first European settlers were the temporary sealers and whalers, who reduced the population of these ocean mammals almost to extinction in a very short time. They introduced disease, prostitution and firearms and developed an unhealthy demand for shrunken heads - so much so that Maori Chiefs began decapitating their own slaves, instead of preserving only those who had been defeated in war. The Maori people soon embarked on wholesale slaughter of one another and by 1830 the Maori population was reduced by a quarter. Alcohol, tobacco tuberculoses, measles, venereal diseases and overcrowding played a huge part in the demise of the indigenous people. The lawlessness problem, most prolific in Kororareka (now called Russell), the unethical ‘purchases’ of Maori land and the threat of French colonisation sparked the British to seek annexation of New Zealand. A treaty was drawn up and read at Waitangi on February 5 1840. With some Maori objections the treaty was amended and signed by 45 chiefs and the British resident, Lieutenant-Governor William Hobson the following day. Over 500 chiefs throughout the country signed the treaty over the next seven months, and Hobson proclaimed British sovereignty, establishing his capital in Kororareka. The treaty seemed to promise benefits for both Maori and Europeans, but discrepancies in translation and misunderstanding of the concept of ‘sale’ resulted in conflict. Many land sales were disputed, some land belonging to whole tribes or local chiefs causing new tribal conflicts selling that of other tribes. The Maori people became more and more reluctant to sell, and known collectively as the Maori Wars, fighting took place in many parts of the country during the 1860’s. Racism was rife with the Europeans abhorring the ‘savage practices’ and equally, the Maori’s dislike of Pakeha material greed and social arrogance. 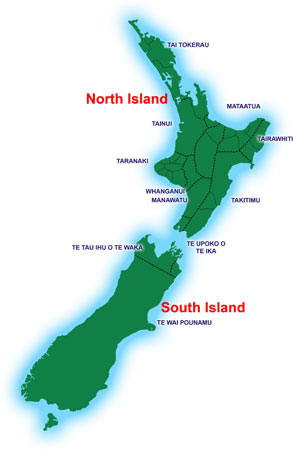 While development of the North Island temporarily faltered because of the disputes, the South Island prospered with new farming and the discovery of gold. As the European population escalated at an alarming rate through continual immigration, the Maori population declined, and with it their mana. By 1900 the Maori population had dwindled to an estimated 42,000 and today, not one fully blooded Maori exists - but thankfully the culture and heritage continues with passion amongst their descendants.